Icebergs, the new structures in Minecraft PE 1.5 and 1.6 are a tempting place to build a shelter because only ice and snow around you and polar bears are not so easy to find. 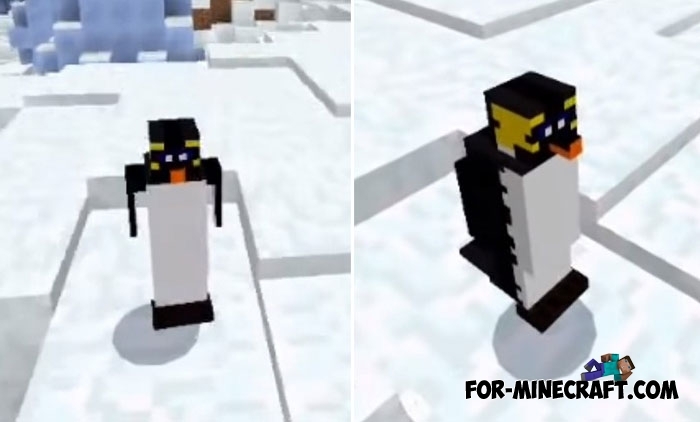 What if you add penguins to MCPE? These birds are half the size of you, they will move slowly in cold biomes where there is snow and only a negative temperature. How to tame a penguin? Want a home penguin? Then catch the fish and find or spawn one penguin and then feed it raw fish. If it likes you, it will become your friend or a pet. Any threat to you is its enemy so control your aggression and do not touch too dangerous creatures if your penguins are nearby. They are weak enough and can not withstand too much impact. How to install the Penguins addon?